When deciding to buy a plot of land or a new house, never forget to bring a compass. You always need to know the orientation of the site to know where the sun would be. The sun predictably rises from the East, arches high across the South, then drops low and sets on the West. This is the easiest to deal with, and also the most important, since you only have one facade and you will face many problems if it’s in the wrong orientation. The best possible choice would be a North facing site. That is the optimum, as it will let in absolutely no direct sunlight. This means that the walls are always cool and you can have as many openings and have them be as large as you want without worrying about heat gain and glare. The neighbors will shade your house from the sun. Perfect. The worst orientation is South West. The problem here is that you have to worry about a hot high sun and a hot low sun that will penetrate deep into the house. 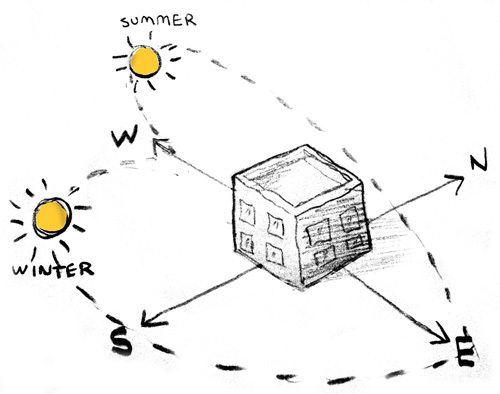 The way to control high sun is different from low, and having both problems at once will increase the design detail. The best orientation is having the opening on the North/South. This means that the neighbors will shade the low, hot Western sun, which is harder to deal with. Controlling the high South sun is easier, and mainly involves horizontal overhangs to shade the openings. A house on a West/East axis will have lots of light penetrating the house. This would be a good thing for a cold climate, but in Kuwait it means lots of heat gain in the house. Spaces will quickly shift from being cold to hot depending on where the sun is. It’s harder to control low sun as you need vertical elements to shade the openings. The best location for a corner site is one facing North and East. The Eastern sun is good, it’s mild and it feels pleasant waking you up in the morning and flooding the spaces with light. It’s not hot yet, and by the time it starts getting annoying it will have already turned the corner and gone away. The worst location is a South and West facing corner site. This has the worst of both extremes. Climate control must be a major factor in the design process for such a harsh site to be successful. The walls will be hot and the sun will pierce deep, but there are design options to help fight back. Of course, like I said before, it’s always better to solve the problem right from the start by picking the right site. It may not affect the price of the land, but the benefit is priceless. Don’t we need (at least some) direct sunlight? I personally love it… and yes even in July. It gives a feeling of health and cleanliness. I chose our South-facing house in order to get some sun (inside and for the small garden)! This is what confuses me about your post. I chose South to get sun, and I think you’re suggesting South to avoid it… Sorry if I misunderstood. In any case, any new home buyer must consider this very important factor. I should have made this point clearer in the post. What I mean by Best and Worst is that it gives you the best potential; meaning that the Worst orientation limits your options because you HAVE to think about blocking the sun. Of course, a little sun is always good, like you said. Just a little. Even in a North facing site, you can still have direct sunlight filtering in through a courtyard or a strategically placed skylight. With a little bukhoor you can even create beautiful slabs of light that dominate and carve the space. Anyway, what I mean is that a North facing site isn’t better than one facing South, but it has more opportunities because it doesn’t limit you in the same way. In the end, of course, there’s never a right or wrong answer and it all depends on context, program and preferences. Indirect sunlight is gorgeous. When a harsh ray of direct light penetrates a space it messes with your eyes and the ‘contrast levels’ start changing. I’ve always advocated for large windows and glass walls but have been undermined with the whole ‘sun and heat’ issue in Kuwait.